He was educated at the Jerusalem Academy of Art and later at the Architectural Association in London. Ron Arad co-founded with Caroline Thorman both the design and production studio One Off in 1981 and later, in 1989, Ron Arad Associates architecture and design practice. In 2008 Ron Arad Architects was established alongside Ron Arad Associates. From 1994 to 1999 he set up the Ron Arad Studio, design and production unit in Como, Italy. He was Professor of Design Product at the Royal College of Art in London up until 2009. Ron Arad’s constant experimentation with the use of possibilities of materials such as steel, aluminum or polyamide and his radical re-conception of the form and structure of furniture has put him at the forefront of contemporary design. Alongside his limited edition studio work, Arad designs for many leading international companies including Kartell, Vitra, Moroso, Fiam, Driade, Alessi, Cappellini, Cassina and Magis among others. 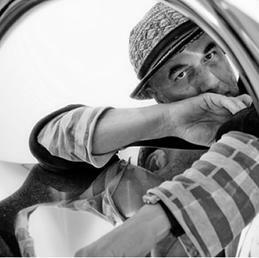 Ron Arad has exhibited at many major museums and galleries throughout the world. Recent and upcoming major retrospective solo shows include Centre Georges Pompidou, Paris (2008), MoMA New York (2009), the Barbican Centre, London (2010), the Stedelijk, Amsterdam (2011).He also has written several books.